Slick magazine is hot off the press! 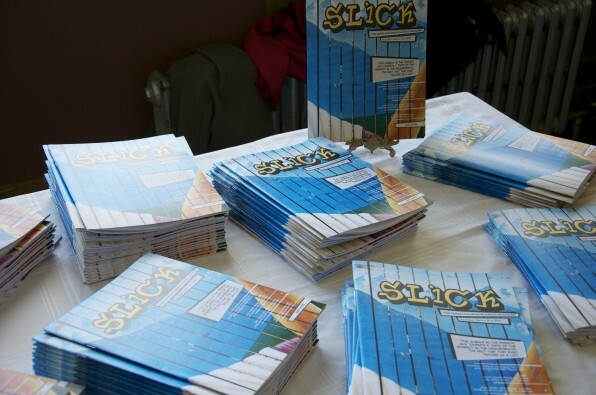 James Lick Middle School’s eighth graders celebrated a semester of hard work as Slick magazine hit bookshelves Thursday. Volume 2, Issue 1 is packed with articles and interviews relevant to middle school students everywhere. This group wrote about peer pressure, eighth-grade graduation, veganism, graffiti, the new 3Ds, fast cars, cyberbullying, making it as a professional soccer player, legends about chupacabras, and the secrets locked inside James Lick’s very own boiler room. This issue of Slick magazine is seventy-two pages of smart, funny, and bold eighth-grade writing. Slick is sick. You can pick up a copy at the Pirate Store.